HONOLULU, HI - MetroAir today announced its plans to launch a new in house subsidiary based in Hawaii. The new airline, launching February 8th is named 'Makai Express' with is roots based on the Hawaiian word for 'Towards the Ocean'. The new subsidiary will be operated on a mixture of new and existing Allegius Bombardier Dash 8-Q400 Aircraft comprising of 7 air frames in total. The first of these newly painted Dash 8 aircraft have already been flown to the Hawaiian islands and are now undergoing crew training and experience flights. Makai Express will offer multiple daily hops around the major Hawaiian islands providing customers with a reliable and competitive service around the pacific archipelago. MetroAir Acting CEO, William Hogarth said "Its a very exciting time for MetroAir to be able to launch this new airline. Hawaii is an important market in the USA with millions of tourists visiting each year as well as many of its own residents needing to travel daily between islands for business" He went on to say "Competition is very limited in the islands meaning the main leaders can simply charge what they like. We aim to shake the market up by offering a reliable, quick and easy service to all the major cities for a price that is competitive" He finished by saying "MetroAir continues to expand its horizons in an ever changing environment and strives to live up to its new slogan 'We take you virtually anywhere' "
Makai Express tickets went on sale today for as little as $29.99 each way which includes both baggage and in-flight refreshments. The airline will be operating daily flights across the islands to Honolulu, Maui, Lihue, Kona & Hilo. 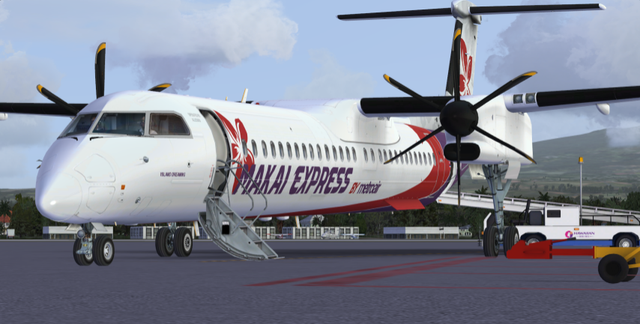 Makai Express will also offer service from Honolulu to Lani & Molokai. The 78 seat Q400 with its short turnaround capabilities make it perfectly suited to the frequent short hops that it will be undertaking. 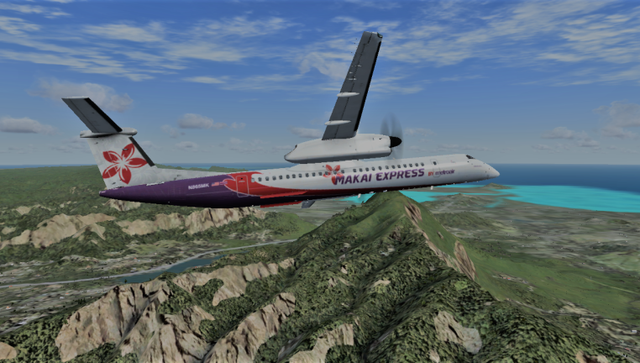 The airlines new head of regional operations, Shane Barton said "The route structure at Makai Express will enable customers to travel at convenient times of the day to suit their schedules. It will also enable business travelers to simply commute to and from work in a day or enable visitors to connect with MetroAir's scheduled services to the mainland." The new venture will enable our pilots to experiance the beautiful rugged terrain of Hawaii and visit some of the most beautiful cities in the Pacific. The airlines striking new Livery was designed by Sean Warren and painted by our very own Roman Geber and Sean Mullineaux. The livery takes its influence from the tropical colors and flowers of the Hawaiian archipelago. Paints will be available for all major simulators such as FS9, FSX, P3D & Xplane-11 with both a freeware and payware option available for all except XPlane-11 which will just be for the FlyJ Sim.